(CBS) Is drinking America's favorite pastime? The CDC estimates that 38 million U.S. adults binge drink. That means one in six people drink at least four or five alcoholic drinks on a single occasion. The CDC's newest report found Americans binge drink an average of four times per month. For the report, published in the Jan. 10 issue of the CDC journal, Vital Signs, researchers surveyed 458,000 Americans who were 18 and older, asking them how much they had drank in the past 30 days. Not surprisingly, college-age Americans were found to drink the most when they binge, consuming an average of nine drinks per occasion. The age group with the most binge drinkers was 18 to 34-year-olds - but that doesn't mean older folks forgo drinking - in fact, they binge more often. Adults age 65 and over who binge drink do so more often - an average of five to six times a month, according to the CDC. Does location matter? Data show it might. Binge drinking was found most common in the Midwest, New England, Washington D.C., Alaska, and Hawaii. Binge drinkers consumed the most drinks in the southern part of Mountain states such as Arizona, Nevada, New Mexico, and Utah. Besides its health risks - a whopping 54, according to the CDC, including liver disease, injuries, car crashes, and sexually transmitted diseases - binge drinking costs Americans big bucks. The CDC says binge drinking racks up a $223.5 tab in terms of missed work, health care expenses, and crime. That's $746 per person, or $1.90 per drink. But what's the health price of binge drinking? Eighty thousand deaths in the U.S. each year, and the chances of getting sick and dying from alcohol increase significantly for binge drinkers. "Binge drinking by adults has a huge public health impact, and influences the drinking behavior of underage youth by the example it sets," Pamela S. Hyde , spokesperson for Substance Abuse and Mental Health Services Administrator (SAMHSA), said in a written statement. "We need to reduce binge drinking by adults to prevent the immediate and long-term effects it has on the health of adults and youth." 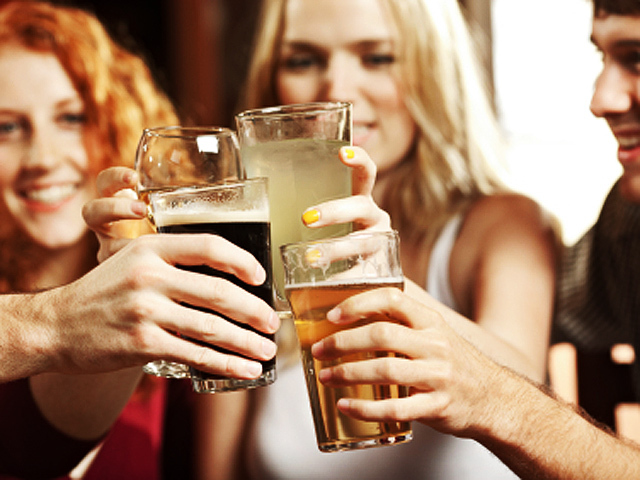 If you're going to drink anyway, drink moderately, says the CDC. US Dietary Guidelines on alcohol consumption recommend no more than 1 drink per day for women and no more than 2 drinks per day for men.